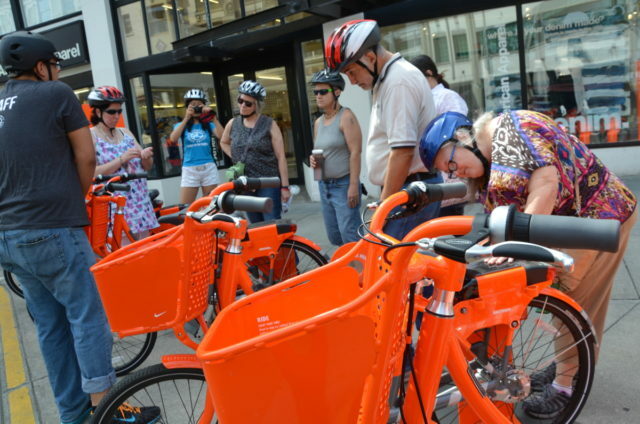 Residents of low-income housing get ready to test Portland’s bike share system. 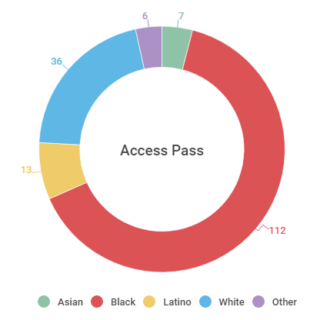 One of the standard tools in the bike share promoter’s toolbox is the free daypass: a one-time trial that becomes, hopefully, a gateway to regular use. But for years, there’s been one little problem with this practice: nobody knows if it works. 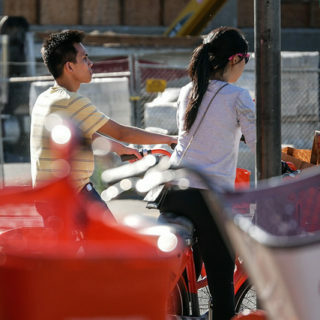 “Third-generation” bike share systems, pioneered in North America by Wisconsin-based B-Cycle and Quebec-based PBSC, didn’t have any solid way of finding out if someone who used a daypass later became a member. That’s because when you used a daypass, you didn’t create a permanent account with the system — you just entered a code, swiped a credit card for any overages, and checked out a bike. Here’s the good news for Roberts and other bike sharing pros: As “fourth generation” bike share systems arrive, they’re able to detect when a daypass giveaway converts someone to a bike-share customer. In New York City, a new version of the Citi Bike mobile app includes user accounts that can trace a single person from a trial to a membership. B-Cycle systems now have the capability to create online user accounts before someone cashes in a free daypass. 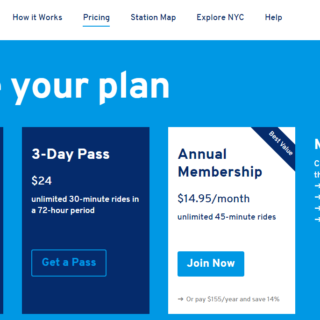 And for systems that use Social Bicycles — Tampa, Orlando, Phoenix, Portland Oregon, Buffalo, Cleveland and elsewhere — every user gets a unique account in the system, and free passes are given out using discount codes. That opens the door to very detailed testing of what methods are best at getting people to not only use their daypasses but to become members. Is it more effective to shotgun daypasses to a wide population and let them figure it out on their own? To give small groups a personal bike-sharing tutorial? To give them a free helmet? To not give them a free helmet? If someone buys a membership, are they likely to keep riding? Do they renew? For the first time, bike share systems are getting sophisticated enough to start answering those questions. Because Social Bicycles and B-Cycle allow single-use, time-limited discount codes, it’d also be possible (though, at least with B-Cycle, very labor-intensive) to use their software to conduct randomized controlled tests, the gold standard for behavioral research. Portland’s month-old system is operated by Motivate using Social Bicycles hardware and software. “The data is there in our system, it’s just a matter of creating the correct formula,” Schafer said. The Better Bike Share Partnership is a JPB Foundation-funded collaboration between the City of Philadelphia, the Bicycle Coalition of Greater Philadelphia, the National Association of City Transportation Officials (NACTO) and the PeopleForBikes Foundation to build equitable and replicable bike share systems. Story tip? Write info@betterbikeshare.org.